Marc Guggenheim’s arc that he began in issue #18 ends here with a conclusion to the story, but not much of a legacy of major impact on these characters. Save for Rachel, all of the X-Men were mostly along for the ride, aiding S.W.O.R.D. and Abigail Brand in warding off an extraterrestrial threat. This issue does not really build the relationships between the X-Men: there’s a brief moment of respect between Cecilia Reyes and Psylocke, but that’s about it. Even the brief scene earlier in this arc where Psylocke and Monet go exploring was much better than any of the character interactions here. Guggenheim likes dialogue, and the verbiage that shoots back and forth between X-Men, Abigail Brand, and others here is fairly well-paced. The dialogue isn’t too bogged down, and the humor doesn’t try too hard. I like when Jubilee calls Manifold Tyger “Manifold Jerkface.” Jubilee is one of the most important characters to get right, due to her relative youth and her abundant energy. Guggenheim captured her well in this arc. One scene is a little confusing: Jubilee’s hands glow with the purple, plasmoid-like spheres of her old, famous power set. Since we know she’s now a vampire and doesn’t have her old powers, maybe it’s meant that she’s wearing special gloves/gauntlets? 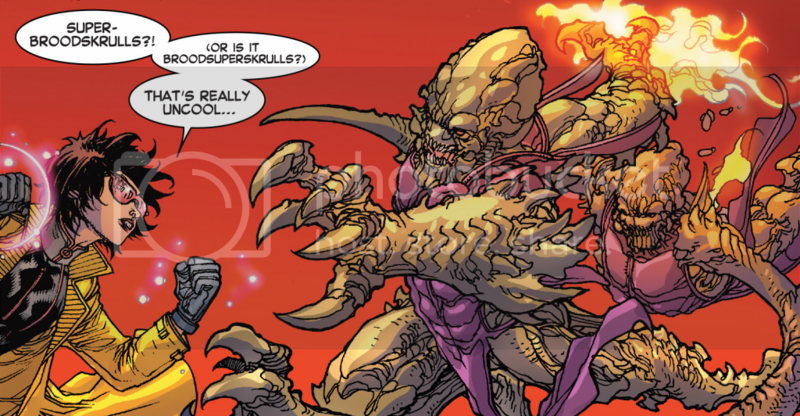 Regardless, it’s cool to see her run after some superbroodskrulls/broodsuperskrulls, ready to pummel them. Harvey Tolibao’s art is cleaner and sharper than previous issues. 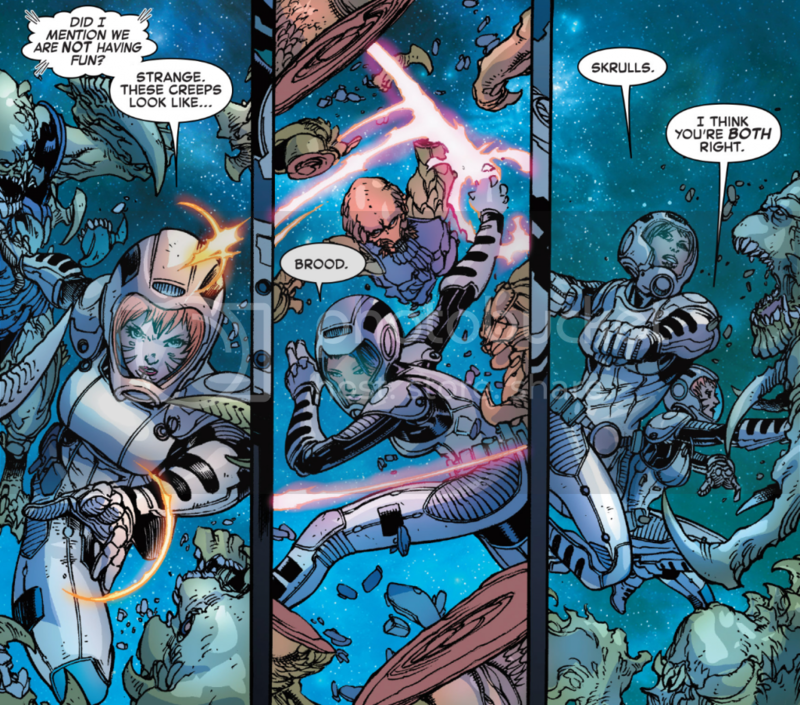 While one two-page spread — a fight scene near the end of the issue — looks too similar to a fight scene in an earlier issue, Tolibao deserves credit for drawing X-Men in challenging poses. In the opening scene, Psylocke, Monet, and Rachel are drawn constantly moving and fighting. Psylocke’s psi-weapons look especially great. As always, Paul Mounts does a splendid job coloring, especially Rachel’s hair and Psylocke’s telekinetic powers. Dexter Soy’s art looks good. I like how he draws Abigail Brand’s long ponytail. A panel where Deathbird leaps in the air and attacks someone looks especially distinct among all the panels in this issue. Rachel Grey finally gets a tiny piece of closure with the empire that killed her entire family. It’s a satisfying end for readers, but we’re left with the awareness that trauma and grief never truly end. Rachel, like most X-Men, is a tough character who doesn’t reveal more vulnerable emotions readily. Guggenheim didn’t go as deep into Rachel’s backstory as I thought he would, but this was probably intentional to keep the story moving. This issue concludes an arc that was not as compelling or gripping as earlier arcs where Jubilee and Shogo held the focus. The panel time on Manifold Tyger was a little bit too much, and the time on Sharada Darthri was not enough. We learned very little of this member of the Providian Order. With Guggenheim’s departure, who knows if the Providian Order will return in X-Men titles. I like the sci-fi but all-too-real premise of this Order’s genetic experimentation. Since the X-Men’s teammate relationships went so underdeveloped in this arc, I look forward to next issue and G. Willow Wilson’s debut.